Welcome to Real Talk, where amazing things happen. 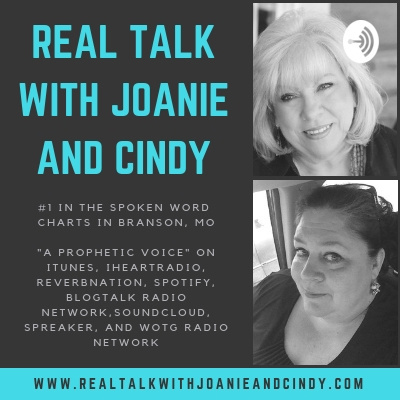 Real Talk with Joanie and Cindy is an inspirational and motivational prophetic podcast with co-hosts Joanie Buchanan and Cindy Hyde. Joanie and Cindy are both Christian authors, coaches, counselors, media personalities, ministers, and motivational speakers who share their love for God and His Word with practical applications that help bring hope and healing to their listeners. They are listener supported. If their ministry has touched your life help them carry the Gospel around the world by donating today. You Could Be The One - Mark 16 [00:28] Jesus said, "I give you all power and all authority over all the power that the enemy has." (Luke 10:9). You have both power and authority as believers. That's what we are supposed to walk in - His power and I thought, well, we're supposed to walk in His power but do we? We have the ability to walk in it if we would just step out in faith and do it. There's a sick and dying world out there and you can be the one who is the hands and the feet of Jesus. You can be the one that lays hands on people and see them be healed. I love the end of Mark 16, verses 15-21. Jesus was talking to His disciples and right before He ascends, He was giving them the last instructions that he wanted them to have before He left them. And what does he tell them? [01:33] All believers, signs and wonders will follow all those who believe, they will speak with new tongues, they will cast out devils. They will lay hands on the sick and they will recover. That's our legacy! It's our job description! It is our mandate! Go Preach the Gospel, heal the sick, cast out demons, deliver the captives, set the captives free, heal the brokenhearted. So, in doing that, when you first step out into obedience, you start trying to do those things and the Lord will work with you just like He did His disciples. I know Joanie has shared about an evangelistic spirit that came upon her when she was young. I didn't have that. I was more the shy one. But through the power of the Gospel, and Joanie just shared it with you: Christ, born of a virgin, died on a cross, lived a holy life. The son of God. He was crucified and resurrected. By His stripes we are healed. The stripes that He bore upon His back were for our healing. And I love the fact that by His blood, the blood of Jesus, we can be set free and healed from everything. He's not just a Healer, He is healing. [03:19] If you're listening to our programs and you would like to support Real Talk with Joanie and Cindy Media Ministry, you can send you donation to http://www.paypal.me/healingcenter. Your donations are tax deductible and very much appreciated. Joanie and I enjoy bringing motivational and inspirational programming to you. If you'd like to hear more programs you can listen to our podcasts on iTunes, Google Play, Anchor, Spotify, iHeartRadio, BlogTalkRadio… and our website www.realtalkwithjoanieandcindy.com. We want you to know how to be successful spiritually because that will mean success for you in every area of your life. Joanie Buchanan and Cindy Hyde unpack success tips using Joshua as an example. Listen to this informative podcast recorded live. "A legacy is not a resume or list of accomplishments. A legacy is the imprint you leave on the future. As a result, we all have a legacy. And we will leave our legacy either by default or design." Brian Dodd Listen as Joanie and Cindy talk about leaving a legacy, share their own stories, and teach you how you too can leave a godly legacy. Real Talk with Joanie and Cindy's new podcast on how Your Attitude Affects Your Brain with Donesa Walker. This episode is full of great advice from an expert in her field. Donesa Walker is the owner of Learning Rx. A business in business to help people from 4 years old to no limit how old learn how to learn and reactivate their brain. Listen to her share how gratitude impacts us physically, how we can change our brains with our thoughts, and how an old dog can learn new tricks. Read part of the ShowNotes Donesa: 06:30 The facts are there. That brain actually grows dendrites. It actually becomes a stronger and better from you having an attitude of gratitude. So when you're thankful you actually breed thankfulness. So your attitude actually changes from that. And in some recent studies they did, they actually looked at how the brain changed and how the effect was on the body and the effect on the body. It reduced stress. It lowered blood pressure, and these are big factors for people. It actually helps in overall health and reducing anxiety. These are all studies that they have done and they've seen that having that attitude of gratitude and being very thankful for your blessings actually made people rewardable. Donesa: 07:24 In other words, when you felt thankful about something, you were more likely to be kind and when we have an era of incivility that we have right now where so many people are ugly and unkind to each other then it is a way of changing our culture just by starting with that small step of being thankful. It's so important that we train this from when our children are very, very young to train them not only to say thank you, but to write thank you notes. Donesa: 08:03 Take the time. Taking the time to say thank you in writing is a big deal because it actually encodes that to the brain. When you're writing, that's a mechanism that actually encodes to your brain. And so it's really important that parents start instilling that at a young age. We get too busy and we think, oh, I'm just going to shoot off a quick text or I'm a send a quick email and we forget that that gratefulness can actually be bred in our children by just doing the exact act that they need to do of writing a thank you note. Very simple. We have been given supernatural power to do whatever God ask us to do. Mark 11:25 And when you stand praying, if you hold anything against anyone, forgive him, so that your Father in heaven may forgive you your sins. "